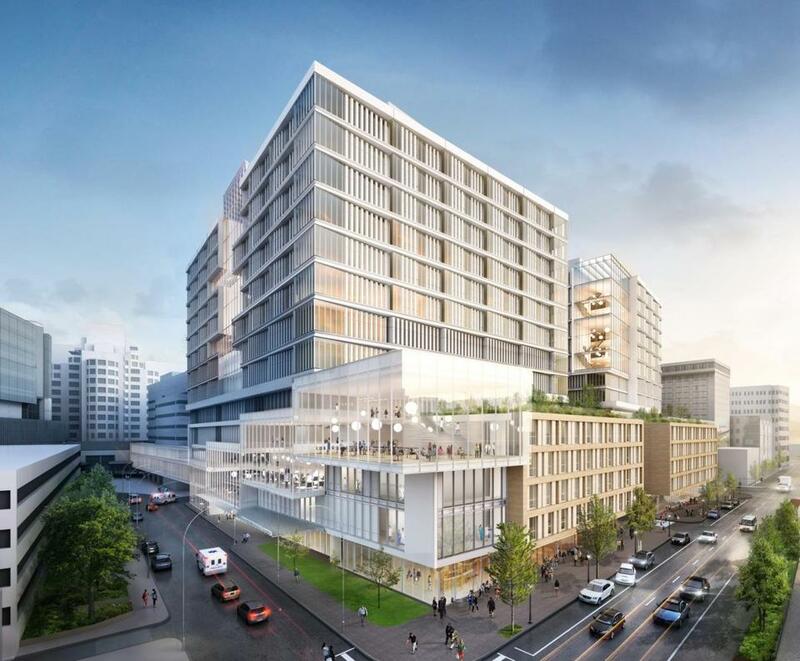 Massachusetts General Hospital, the busiest medical center in the state, plans to spend more than $1 billion to build a large addition to its crowded campus to keep up with the demand for high-end medical care and compete for patients from around the globe. The project is likely the largest ever proposed by a hospital in the state, and promises to reshape a busy stretch of downtown Boston between Government Center and the Longfellow Bridge. It would include two connected 12-story towers on Cambridge Street, with hundreds of private patient rooms, a heart center, a cancer center, operating rooms, and other clinical areas. Mass. General expects to be able to treat at least 100 to 200 additional patients when the building — spanning 1 million square feet — is complete in about seven years. The project comes as other hospitals in the city are expanding as well. It is expected to be bigger than the more than $1 billion expansion now underway at Boston Children’s Hospital. Beth Israel Deaconess Medical Center is also planning a smaller 10-story tower in the Longwood Medical Area. Mass. General’s addition, with a completion date of 2026, would be built on property the hospital already owns. Hospital officials would demolish the existing Parkman Street parking garage and construct underground parking below the new building. They expect the project will involve 4,500 construction jobs and allow them to hire new hospital employees. Mass. General will file its preliminary plans with the city Wednesday. The project requires city and state approvals and is likely to face scrutiny because of its significant cost — and the worry that the costs could trickle down to local patients and consumers. Mass. General, owned by Partners HealthCare, is widely renowned and among the state’s most expensive hospitals. In interviews, hospital officials described the expansion plan as critical to supporting the growing numbers of patients who need cancer treatment, cardiac care, transplant surgeries, and other services. The hospital’s facilities are largely outdated, they said. Most Mass. General patients have to share rooms. Only 38 percent of rooms are private, among the lowest percentages in the city, said Dr. Peter Slavin, president of Mass. General. “If this region wants a world-class academic medical center like MGH, we have to renew our campus and keep it modern and terrific for our patients and competitive not only with local competition but the national competition as well,” Slavin said. Mass. General currently has more than 1,000 beds and is usually filled almost to capacity, officials said. On any given day, dozens of beds may have to go unused because of infection control and other reasons. During a tour one recent afternoon, the emergency department was full, as patients spilled into the hallways. More than 30 were waiting to be admitted, but no beds were immediately available. While most of Mass. General’s patients are from Massachusetts or New England, the hospital also competes for patients with complex medical needs from all over the world. About 3 percent of its patients are from states outside the region, and 1 percent are from other countries, hospital officials told the Globe. Patient numbers have been growing, as have profits: Mass. General earned $252.4 million in income from operations last fiscal year, on revenue of almost $4.1 billion. Founded more than two centuries ago, Mass. General’s campus is a mix of old and new. Some patient floors still in use today were constructed around the time of World War II. Patients in those areas are paired up, separated by just a curtain. By comparison, the hospital’s last big addition, the Lunder building, has spacious single rooms, giving patients and families more privacy, and a quieter place to recover. The proposed new building, which has yet to be named, would be twice as large as Lunder, which opened in 2011. It would include 450 single patient rooms, but hospital officials also plan to close and repurpose older patient areas, so they ultimately expect to gain about 100 to 200 new patient beds, they said. Mass. General, which is structured as a nonprofit, recently began a campaign to raise $3 billion from private donors for the hospital’s programs over seven years. Hospital officials expect that about 20 percent to 30 percent of the cost of the new building would be paid for by donations. The project still needs approval from several agencies including the Boston Planning & Development Agency and the state Department of Public Health. It also could be reviewed by the Health Policy Commission, which studies issues that affect the cost of health care. In 2016, the commission warned that Boston Children’s Hospital’s expansion was likely to raise medical costs by drawing patients from other lower-priced hospitals. The Department of Public Health later approved that project with conditions. Mass. General’s project could face similar scrutiny. Mayor Martin J. Walsh, in a statement Tuesday, voiced initial support for Mass. General’s plans. City Councilor Josh Zakim, whose district includes Mass. General, noted the hospital is not trying to acquire new land but is staying within its existing footprint. Zakim added that he’d like to see the hospital contribute to traffic improvements on Cambridge Street, which is often congested.